Welcome to Baby Name Scramble! Kudos to you for getting a comprehensive, personalized list of baby name possibilities for the child-to-be in your life! CLICK HERE TO GET YOUR FREE BABY NAMES! Type in any two names and our baby names "machine" will scramble up those letters and create a brand new list of unique, popular American baby name possibilities — just for you. Then, your unique list from BabyNameScramble.com will automatically be emailed to you at whatever email address you put into our order form. In fact, your new list of both baby boy and baby girl names will be sent to you via email within a matter of minutes. (And, to be fair, if for some reason the two names that you input generate fewer than 10 new names, you will not be billed at all.) What a great baby shower gift idea! Click here to see, step-by-step, how your list of unique baby names will be created. So, get creative! You can input the baby's parent's names, grandmother’s names, maiden names, existing children’s names, and so forth. Obviously, the list of unique names that BabyNameScramble.com gives you can be used for first names; but, they also can make wonderful middle names as well. As you can clearly see, the possibilities are endless. The more lists you try, the best chance you have of finding an even better selection of unique, popular, American baby names for you to choose from, for the all-important baby-to-be in your life. If nothing else, your unique list based on names that are important to you will be a nice addition to any Baby Book and a great gift idea for baby showers and other baby gifts. At the very least, the child will know how much time and thought you put into naming him or her. And, please do us a favor, and use the "Refer a Friend" button above to pass this website along to someone you know that would enjoy this creative process of finding unique baby names! We have found that many people have a few names they would like to use as meaningful input for the selection of possible baby names. Perhaps on one round, you input the names of both parents, then on another round you input two grandmother’s names, then on another round you input maiden names. You can do as many as you want. That's up to you. Perhaps one list of baby names is to find the perfect first name for the baby and the other list is to find perfect middle name possibilities. Regardless of the reason, we think it’s a great idea to generate more than one list. So, we have devised our pricing structure to give a discount to anyone interested in more than one list of baby names. But please note, if you choose to purchase more than one list, you must be ready to input all names for all lists at one sitting. For example, have Linda & Lee ready to input, then Eleanor & Helen, then Montgomery & Nolton. We hope you enjoy this flexibility in pricing. 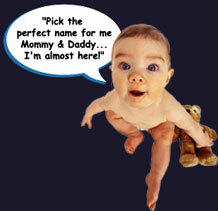 It’s our goal to help you find the best possible baby names for you and your family! To get going, simply click here to use our baby names list generator. Have fun!